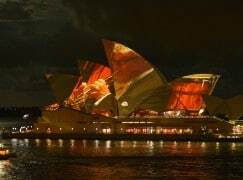 This is Andrew Haveron, concertmaster of the Sydney Symphony Orchestra, projected last night out of his seat and displayed on the roof of the opera house. The event was a Visions of Vienna concert, promoted by the Austrian tourist authority, and it went down well with a crowd of thousands milling around the harbour, listening to the music and watching the images change. To spice up the Strausses, they added an occasional Klimt. 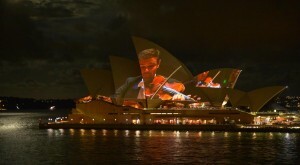 Tony David Cray, Head of Recording and Broadcast at the Sydney Opera House, used 14 cameras inside the Concert Hall – including five lipstick cameras inside the Orchestra – to film the performance, which was projected live on the sails by Technical Direction Company. More than 3,000 people attended a free public event hosted by the Vienna Tourist Board at Campbells Cove in the Rocks to watch the spectacle on the sails of the Sydney Opera House. What happened to that, I wonder? I’m a Sydney music lover and constant concert goer who thinks she’s well plugged in to what’s happening. Obviously not! Where was this advertised? This is the first I knew of it. A shame it wasn’t more widely promoted. Sorry to hear some people missed the show. Husband and I were in Sydney for holidays and managed to see this amazing spectacle. As classical musicians we were dubious but from the first few minutes realised there was nothing to worry about. The sound and video managed to convey the performance brilliantly. Don’t know how they did it! 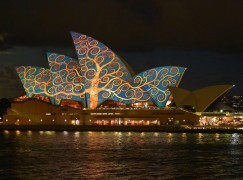 Well done to the Symphony and Opera House for being brave. jeez, this is ow us ozzies loik ow mewsik millin rownd the arbor with a fostas or a kardonay facebookin en cruzin fer chix . Dear RW2013 – please tell me where I can find Fosters? I’ve lived in Sydney over a year now and I can’t find it anywhere – only those Bogen craft beers. I’ll offer you two tickets to any of our subscription concerts in the next three weeks in exchange for ONE TINNY of the amber nectar; you can choose from a complete Schumann symphony cycle, premiers of works by Jorg Widmann and Georges Lentz, works by Debussy, Mendelssohn and Boulez, or perhaps some Wozzek? Beethoven 9? Obviously we’re trying every trick in the book to keep our three capacity subscription audiences happy: This season all the men are wearing matching socks to aid visual stimulation for the punters and I may even consider trying to get all the bows to move in approximately the same direction just to see if it makes it any more enjoyable for them. If you don’t fancy my offer I might have to pass the tickets on to Marguerite – above – as an apology. grate nick mate! haveron? yer havin me on!!! mate oi sing “Wir arme Leut!” in the showa en crank up …explosante-fixe… en caeli enarrant wen oim doin the mowin !!! erd it all befor! en ta getta fostas ya fisicly hav ta go inta a bloody pub, thers a few in sinny !! cheers mate en to the foxy Marguerite – enjoy the visions a widman on the opra ouse roof! I think it’s great PR and must have looked stunning. I hope the quality of the sound matched the visuals.